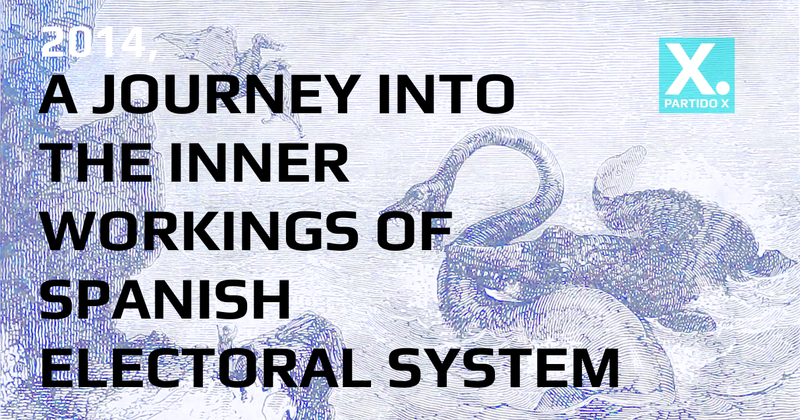 2014, A Journey Into The Inner Workings Of Spanish Electoral System  Partido X. This is our final evaluation. We’re sorry we took so long, you’ll soon understand why. Yes, it’s a very long evaluation. We suggest you sit back and make yourselves comfortable before you start, and we ask you to please read it calmly and carefully. Which is the spirit in which we wrote it. We didn’t want to leave anything out. We owed it to this project, that so many people have worked on for such a long time, and to the many people who supported it with their vote or otherwise. We needed to take a break, compile all the feedback that we have written or received form thousands of people, and analyse this adventure so far, as well as the new scenario that is opening up, and how to continue to act within it. On this latter point we will write more after our general meeting of the Red Ciudadana on 15 June, which will include the participation of all the people who actively participate in it. The text we are publishing today will still be modified after publication based on comments and contributions. 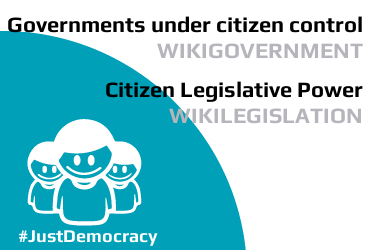 We would like to thank all the people who help us each day to construct and understand this citizen method prototype to achieve Democracy. Or as we say, Just Democracy. In the wake of the recent European elections, we are left with a civil society that was able to transmit a forceful message. Voters from all over have positioned themselves to teach a lesson: the two-party system is over, and we are witnessing the start of a new scenario for a new type of governance, in which a more active citizenry takes centre stage. And that’s not the only reason to rejoice: the fearsome LOREG – the ad hoc legislation to favour the two-party “system” based on an extreme interpretation of the D’Hondt system – is foundering and starting to prove ineffective for the first time. Huge divisions are opening up and changing the map of the old constituencies, those that were considered “safe” seats for the PP and PSOE (Spain’s two major parties) or “very difficult” for any other option to gain a foothold. The 15-M Movement has been an empowering historical change; a transition from a passive civil society to an active and constructive one, a philosophy, a space that many of us have contributed to creating and have dwelt in, and a forge for new tools for struggle, and we believe that in all of these senses it has been crucial for bringing about this change in attitude. In this text we will explain how we have seen and lived through this process from within, from the work we contributed as the Partido X Citizen Network and from the challenges we have faced. It has been an extremely interesting and rewarding experience for us, and this text and everything in it should in no case be interpreted as a grievance. It is simply a diagnosis of the events, a diagnosis that we would never have been able to make if we hadn’t entered a sphere that we knew, from the outset, to be playing field that had traditionally been an exclusive preserve. The text is a mix of general remarks about the situation that we had to face as organised citizens who decided to enter the game, and explanations about how we handled ourselves, with greater or lesser success. Note: In this analysis we will inevitable often refer to the party Podemos and use it as a measuring stick, given that “the Podemos effect” was the most notable event in these elections. The new agents who made a strong entrance in these elections, of which Podemos is the principal example, are central to the analysis of the current situation, and we do not refer to them with any intention to criticise but as key elements without which the analysis would not be complete. 15-M was a turning point in Spanish politics. Also in electoral policy, which we will discuss in this text. 15-M has destroyed the electoral map of the last 20 years. This electoral map, which was the key of party politics, was characterised by the inevitable rotation between two parties, the two sides of the system: the right wing PP (or, in the autonomous communities, CIU, PNV and CC) and the socialist party PSOE. This rotation was sustained by a maximum of two million voters, who, disenchanted with the government in each term, changed their “tactical” vote to the opposition, who then disappointed in turn in government, pushing them into the arms of the opposition… and so it went for 20 years. The “alternatives” were the united left party IU or, more recently, the social liberals UPyD, which acted as third parties in unlikely government pacts (particularly IU) or added the note of complaint and “democratic dissent” that guaranteed the image of “democracy” as it had been understood in the Transition: a two-party system with the right to complaint, as long as the complaint is institutionalised in an orderly manner. On 14 May 2011, the PP and PSOE together, hereinafter the “PPSOE” had 80% of votes. After the municipal and autonomous community elections in 2011 (only 6 days after 15-M) and the general elections of 20 November 2011, faced with the triumph of the PP in the municipal and autonomous community elections, followed by its absolute majority in the general elections, many people where disillusioned by the election results and concluded that the 15-M movement had been useless, at least on the electoral front. But a deeper analysis of the facts revealed a different story. The dynamics of the transfer of votes between the PP and PSOE had been broken. Although Mariano Rajoy had won the largest absolute majority of any PP president in history, his party obtained less votes than the previous PSOE president Zapatero when he had governed without a majority in the previous term. More striking still: the PP obtained barely 0.3% more votes than in the previous elections, which it had lost (adjusted to take into account the increase in voters during those four years due to population growth, the figure decreases to 0.1%). Very few voters bought the change that Rajoy was proclaiming. For the first time, the decrease in the number of votes that went to one of the two sides of the two-party system did not result in an increase of votes for the other, even though the Electoral Law translated it in terms of power. For us it was clear. And we think that the same can be said for much of civil society. After a deafening #NoLesVotes (“don’t vote for them” campaign), a little mechanism that some of us prepared for the General Elections, the PPSOE tiebreaker project #Aritmetica20N had 600,000 visits in 5 days, making it into the pages of all the newspapers and becoming the seed for the Partido X Citizen Network. The figures would never again work out for PPSOE, in spite of the unfair Electoral Law that was designed to ensure they always would, no matter what. From now on, society would have a say in them. It was the beginning of the end of the two-party system.. In the autonomous community elections in Andalusia, the tricks of the Electoral Law stopped working, and the fact that the PPSOE was in free fall could no longer be ignored. In the autonomous community elections in Galicia, the PP lost almost 1 of every 4 voters, but thanks to an Electoral Law that was made to measure, it achieved one of the largest absolute majorities in its history. In 2013 there were no elections, and the PPSOE could continue to enjoy its absolute power and pretend that everything was still the same, while the society that had activated and awakened the 15-M movement continued to undermine the foundations of its electoral power and to work on programmatical proposals for grassroots change, such as the PAH, Marea Blanca, 15MpaRato, etc. So when election day arrived on 25 May 2014, the work continued. The civil society response was strong and clear: the end of two-party system, a protest vote reflecting disaffection with the PPSOE, from both the right and the left, and a vote to renew our presence as citizens in all elections. Things will not go back to how they were. This is a great victory and a demonstration of the proactive action of a society that is no longer willing to remain passive..
One protagonist that has barely been discussed is the tactical use of abstention. On one hand, there has been a resurgence of active abstainers (people who only vote if they think their vote will actually be useful), and on the other there has been abstention on a mass scale by usually disciplined PP voters who are disgruntled. This wasn’t discussed much in the days around the election, but we saw it as an important starting hypothesis: a symptom of a society that is no longer resigned, and that will use whatever weapons it can to act. We have come a long way since the early Anonymous campaigns that aimed to mobilise traditional abstainers around options that maximise their effectiveness. The PP lost 18% of votes compared to the previous elections in 2011 (a massive blow, no matter how you look at it). These traditional voters who refused to vote for it this time, shifted to other options as follows: Vox on the right (1.56%), and UPyD (+ 2 %) and Ciudadanos (approx. + 4%) on the other side. But many classic PP voters, who are disciplined and not fragmented like those of the ‘left’, decided to express their disappointment by not voting. Even so, the abstention rate declined, and not just because of the spectacular increase in participation due to the Catalan situation – where the massive impulse to vote in favour of the “right to choose” (Catalan independence) was capitalised on by ERC, which led to a drop in votes for CiU. This means that many active abstainers have been mobilised this time. In short, this is what happened: a large part of civil society wanted to give politicians a clear signal, and looked for the smartest and most effective way to do it.. The famous “tactical vote” that PPSOE had always appealed to in order to instil fear in voters, under the illusion that only two parties were possible, thus keeping everything for themselves made itself heard. But this time it said: never again. It said PPSOE is finished. And so, in the weeks leading up to the election, civil society was reflecting on which of the existing options would most effectively teach the PPSOE this lesson. There was a lot of debate. People were worried about breaking up the vote. The debate was so intense that the PPSOE unsuccessfully tried to take advantage of it by repeatedly warning against the danger of voting new options. In social media and on the street, people were talking about tactical votes. A tactic to put an end to the PPSOE on a mass scale. Let’s look at the options that were on the table, and also at where we positioned ourselves and what happened next. UPyD as a traditional, consolidated party, perceived as more ‘modern’ than the PP, as a protest vote against it. Ciudadanos, a party along similar lines that has won seats in Catalonia and was presenting itself as a new option at the national level, even though it is its fourth attempt to expand beyond Catalonia. The growth of this party in the last Catalan elections, where it obtained 9 seats, gave it a financial base from which to run. It put a lot of work into its campaign, although it was ultimately only TV-based, with a candidate being chosen to appear on talk shows. IU as the traditional, established option for the left, as a protest vote against PSOE. Primavera Europea (Compromís-CHA-Equo). An alliance of existing options that had won seats at other levels of government, and came together as a single candidacy in order to achieve representation in the European elections for the first time. They are the Valencian pro-independence left, the Aragon pro-independence left, and the Green left. 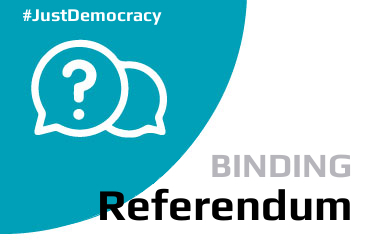 There are other established parties in Catalonia and the Basque Country, such as ERC which runs as an option against CiU (Catalonia), or EHbildu against EAJ-PNV (Basque Country), for voters who want to break away from traditional parties and from Spain’s central government. EXIXTING OPTIONS THAT DON’T HOLD SEATS, AND THAT HAVE A STEADY BASE of around 100,000 voters. PACMA and Escaños en Blanco have been growing slowly over the past 11 years. They have their own constituency around a very specific message: animal rights in the first case, and the defense of blank votes that are tallied in the second. VoX: A new party to the right of the PP, which has a classic former PP politician, Alejo Vidal-Quadras, as candidate, and the financial support of several big businessmen. Partido X: We emerged from the philosophy of the origins of the 15-M, based on non-ideological transversality, in which citizens work to achieve certain minimums by cooperating, or federating their skills. Partido X is based on the idea of methodologically revising the channels that allow civil society to effectively control public institutions, and to contribute their skilss and knowledge so that the minimum demands developed by 15-M and later mobilisations can come into being as real, legislative solutions through the work of the people and organisations who have worked on them. Podemos: Revolving around the media-friendly figure of Pablo Iglesias, Podemos represents the section of the 15-M movement that, in the second stage, organised itself around the traditional demands of the left. Podemos declared themselves to be the direct spokespersons of the social movements and their demands, and used many of their slogans and images as their own. Then there is also the party led by Elpidio Silva (RED) Relying on the public profile of a highly publicised trial against the banker Miguel Blesa, the judge Elpidio Silva, who many people saw as a symbol because when he became famous for being persecuted and unjustly removed from the Blesa case, destroyed his own campaign by trying to appropriate the language of 15-M with numerous bad practices: the use of the 15-M “brand” in his merchandising, primary elections that were announced but never happened, a crowdfunding campaign that was changed several times after it had been set in motion, plagiarism in his programme, and other similar things that resulted in a loss of credibility and followers, in an attempt to simulate a “movement” that didn’t exist, and to indiscriminately accuse everybody of attacks against him that hadn’t happened. He virtually didn’t campaign beyond his twitter account until the final week, as we will see below. Podemos, which was better known than us because of the TV appearances of Pablo Iglesias and because of the party’s strong presence in Madrid, had double the numbers that we did. 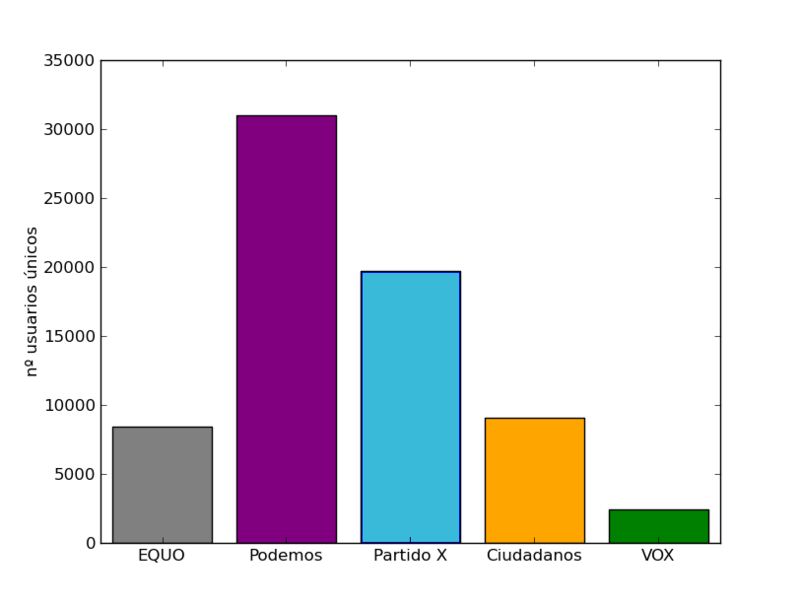 The Compromís-CHA-Equo coalition had a much lower impact than us in social media, but a solid and relatively steady constituency, although they ended up losing some ground in these elections: at this point, we were more or less shoulder to shoulder, and the same goes for Ciudadanos. By this point, Elpidio Silva’s RED party was way below the others, and had almost disappeared, as illustrated by his almost negligible impact on social media after the week when his trial took place, and by his crowdfunding campaign which began with a target of 250,000, then 20,000, and ended with 6,240 euros. Important note: we insist once again that this text is not intended to express a grievance. We knew what we were getting into, it would be absurd to be shocked to discover that many agents and interests come into play in an election campaign. We are simply recounting what we saw because we think it may be useful for everyone to know the process from within and to learn to supervise it as citizens. That way we will avoid repeating the same errors and, step by step, contribute to achieving our goal: that one day the electoral process will become a truly democratic process, without abuses of power or the meddling of created interests. As we were saying, we were aware of being in process in which we needed to counteract the power of television through social networks and on the streets. From the beginning, we knew this: we had to present our project forcefully, so that it could make the leap from social networks to the mainstream media. We knew this, and we certainly achieved our aim in the year-and-a-half since we began. We are the new electoral “project” that was most written about in the national and international press in the lead up to the elections, and our promotional video was screened on many television stations, and received 200,000 visits on the net in a very short time. We know that its going to be a tough fight in a battlefield that is a closed shop, with many interests at stake, and we’ve always known that we have to create information cracks through which we can slip in, even though we don’t have any links to traditional media and television. And that is just what we did. We hope that this explanation helps those who keep telling us that “you have to have a stronger media presence”: we know, we’ve worked on it from the start, and even though we didn’t have any pre-existing media support, we’ve achieved exemplary results that can be seen in our featured press clippings.. Without famous personalities, or even visible figureheads for the first few months, without political or business alliances or support, we’ve managed to come out in the media repeatedly, working through networks of many active people who have been able to make themselves heard. And our contributions and our work have had enough of an impact to push the mainstream media into constantly taking us into account. But we did make the mistake of trusting one thing: that TV stations and the traditional media would abide by the democratic plurality required by Spanish law (LOREG art. 66) during an election campaign. It wasn’t so. This was a serious error, based on our total naivety. Even so, we worked right up to the last moment, managing to scrape a final five minutes on Cuatro TV on the last day of the campaign – a drop in the ocean that we mention as a tribute to our team’s efforts to achieve the impossible in the most difficult conditions. First: due to internal lobbying by some of the participants, which we were able to verify, we were not invited to the emerging parties debate on La Sexta Noche. When we contacted the network they were unable to give us any reasons, even though by that time it was clear that we were one of the most-talked about emerging projects in the lead up to the elections, and we had a stronger presence than other parties that were invited to be part of the programme. Even so, we put up a good fight, and we managed to get them to broadcast a few minutes of our candidate Falciani at the end of the programme. Meanwhile, we “hacked” the timeline of social networks during the debate with a very active and knowledgeable community that answered questions in real time, so that our information was the most shared during the broadcast. But the damage had started to be done: during the debate more people became aware of us, and our number of followers increased more than those of other participants, but in the eyes of mainstream audiences, that was the point at which we ceased to be among the options “that are on TV”. This was 3 May. Five days later, the prestigious CIS research centre released its poll. Even though the only two early polls (both conducted by Metroscopia  ) found that our base was growing steadily (and this was backed up by growth charts for social media, google, etc. ); even though the figures forecast a minimum of 0.3%-0.4% of the vote; and even though the percentage of undecided voters was still estimated to be 20%, and all the figures fluctuated between 0.3 and 1.0, we did not appear in the CIS survey, although other parties with a similar number of expected votes did. We didn’t understand why, so we rang the CIS and asked them to explain the process to us. The person who answered started by saying that the poll collected spontaneous responses… but then they rectified and said it was a decision. And, indeed, anybody can see that it was a decision by looking at the CIS survey form. It’s true that the people surveyed may have been asked for a spontaneous response, but the answer was recorded in one of a series of pre-determined checkboxes, and these checkboxes are tallied as they are, regardless of whether some responses don’t fit within them. It was decided in advance to include only two new parties: VOX and Podemos. This certainly counts as predetermination. We will never know (or maybe one day we will ;)) what percentage of the “Others” checkbox corresponded to Partido X, for example. And remember that although we’re focusing on our own case here, this also affects “others” :).. Somebody had decided to visibilise certain parties for no particular reason. This has always happened, and it will continue to happen until we make it stop. Once again, we insist that we are not writing all of this down as a complaint. This is how things are and always have been. This is how elections are put together, and we want to share what we learnt when we saw it from the inside. We guessed what we were getting into, and like “explorers” we are now writing down what we saw, and we publish this diagnostic so that, as citizens, we can work towards changing the system and making sure it doesn’t happen again..
Generally speaking, we don’t put the blame on machinations or political conspiracies for what could simply be stupidity, arbitrary habits, decision-making without citizen control; this also goes for the designers of the CIS questionnaires. They also watch TV, and they are based in Madrid. So when it comes to considering the existing options, perhaps those that they haven’t seen on TV or haven’t heard people discussing in the bar before work, are more likely to stop existing. If nobody ever supervises them, it might be that simple. It is obviously arbitrary, and it produces the same results as intentionality would. Either way, from now on, citizens will be watching. While we managed to deal with the first critical juncture – the debate on La Sexta – with relative success, and even managed to reach more people as a result, this second setback made everything more difficult. 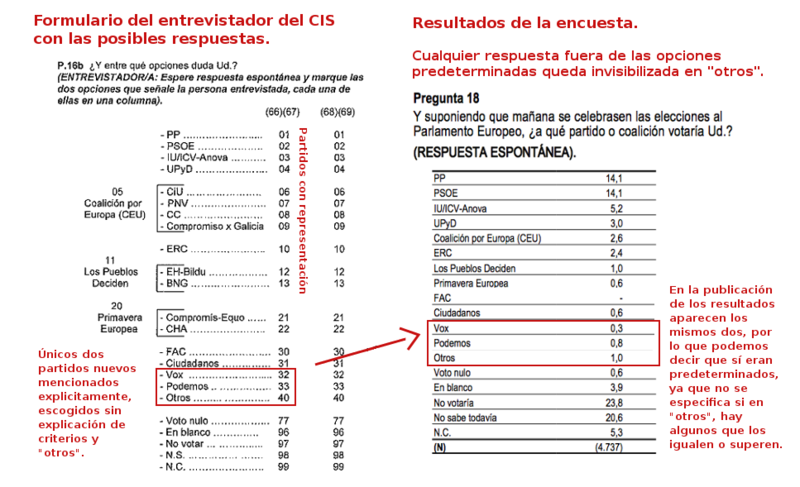 Television networks used the CIS survey to justify their decision to deny us interviews and, for example, a long interview that La Sexta recorded with our candidate Raúl Burillo as reparation for not having invited us to the debate, never went to air for this reason. (Incidentally, after the elections, La Sexta contacted Burillo for several interviews ;)). So now we get to the start of the campaign. Article 66 of the Ley Orgánica del Régimen Electoral General (LOREG) in that article establishes the obligation for public and private media outlets to offer political and social plurality and information neutrality during election campaigns, and the obligation to respect plurality and the values of equality in programmes broadcast in the leadup to elections. Much airtime and newspaper space usually goes to parties with representation, with the excuse that their representativity is guaranteed by their results in the previous elections. The same goes for parties that have already participated in previous elections: their presence in the media depends on the results obtained. But new parties, in theory, should be programmed under absolutely equal conditions. In theory, according to the law, there is no ethical or legal reason for which some new parties or parties with less representation should be given more TV airtime than any other party in the same conditions.. This is particularly important in the final week before an election, given that some 20% of voters decide in the last few days. Let’s see how airtime was divided in the period between the presentation of candidates (28 April) and the end of the election campaign. The breakdown shows how, in many cases, most minutes of airtime are concentrated into the final 3 days of the campaign. There is also a clear difference between PACMA and EB, which, with a similar lifespan (10 years) and base of supporters, were treated differently by the television networks: PACMA was given airtime and virtually doubled the percentage of votes compared to the General Election in 2011; EB was not given airspace and only grew slightly. As can be seen in the breakdown, in order to avoid complaints that could have interfered with this policy, television networks showed relative restraint when inviting candidates to talk shows during the first week. On the other hand, it is generally known that voters who have not decided who to support way in advance tend to do so in the final days before an election. 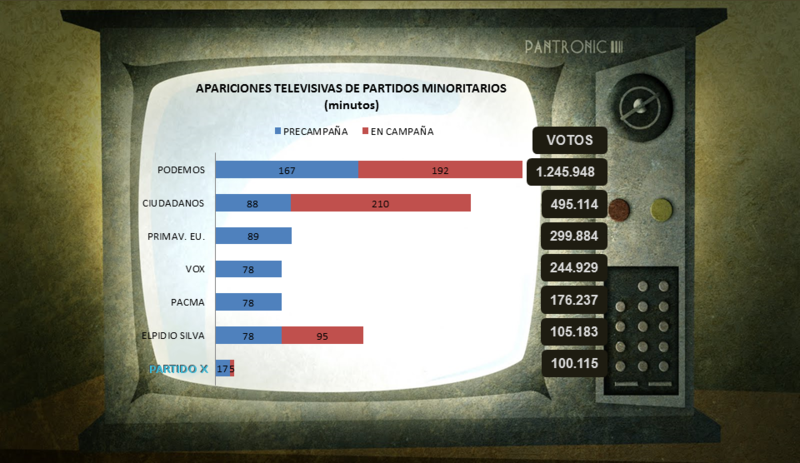 Elpidio Silva, who, as explained above, had lost a lot of support and had barely campaigned, made a come-back the day before the end of the campaign, rising from the ashes as a guest during a whopping 1 hour and 20 minutes on the most-watched programme on Cuatro, Las Mañanas de Cuatro. That was in addition to a 7 minute live-to-air interview the previous day. Meanwhile, Pablo Iglesias (who had already been on air for 2 hours the previous day) and Javier Nart spoke for over half an hour on Al Rojo Vivo (La Sexta), discussing the end of campaign in what seemed more like a chat between friends than a conversation between a journalist and a politician. We saw that all was lost. TV networks decide the players. In the previous days, our position in comparison to the other parties was as we have described above. But now, suddenly, in the last four days of the campaign, our distance from them had increased tenfold. People were looking for the winning horse that could give a whopping blow and teach the major parties a lesson. TV decided who was in the lineup, based on audience criteria. People reasonably decided to concentrate their votes on options that sounded familiar,, and this is what they did. Many people wrote to us after that Thursday and explained their behaviour along these lines. Many people who were undecided until the last moment decided to apply this criteria, to avoid being “left out” and not having an impact. To start with, we want to repeat that everything we have explained above is an account of how private television networks have dodged the legal requirements, and that it is in no way a criticism of the candidates-talk show guests that were able to intelligently use this privileged window. Otra cuestión bien diferente es que debamos oponernos como ciudadanía a que los criterios de audiencia interfieran bruscamente en las decisiones electorales, pero en este caso no decimos nada que no sepamos todos ya y contra lo que no estemos luchando desde muchos ámbitos de desintermediación ciudadana de la información: los productos televisivos interferen completamente en nuestra realidad. It’s important to note that we’re not saying that the candidates who were able to make it onto talk shows won because of television, but they were able to work out that if they weren’t on TV they didn’t have a chance. They did the groundwork, they saw the crack (when politicians from the main parties, like Valenciano and Cañete, are the guests people change channels, and TV networks want audiences). They skilfully manoeuvred themselves to be invited, and they were able to take advantage of the situation. In the specific case of Podemos, we want to point out that they did excellent strategic work, and that out of all of us who were in the game, they were the smartest and most efficient in terms of electoral strategy. They were able to plan ahead and prepare the ground, thanks to the work of Pablo Iglesias himself and his colleagues from La Tuerka (the political debate programme he hosts), without anybody’s help and with a great deal of skill. Through this independent, self-styled programme, they have worked very hard to earn a substantial and well-deserved niche audience to start with, and then a space hosted by other media outlets with more funding and infrastructures, such as HispanTV and Público. They ended up making Público TV their base, and from there they were able to directly influence the information that reached the station, so that it virtually became their campaign media outlet. They were also able to very skilfully participate as a counterpoint in the debates on Intereconomía, and in this way Pablo Iglesias managed to make the leap to Cuatro and La Sexta as a regular talk show guest twice a week, thus building himself up as a recognisable figure with clear, consistent claims and demands. It was only after doing this groundwork that they launched an attack on the electoral front, using a highly effective mix of traditional TV and “transmedia” on social networks to spread their message and generate feedback. Meanwhile, Ciudadanos didn’t work quite as hard on their campaign, which had funding from the start given that Ciutadans (the Catalan branch of the party) held 9 seats in the Catalan Parliament, while at the same time it was seen as a new party in the rest of Spain, strengthened by the constant presence of its leader in the media. 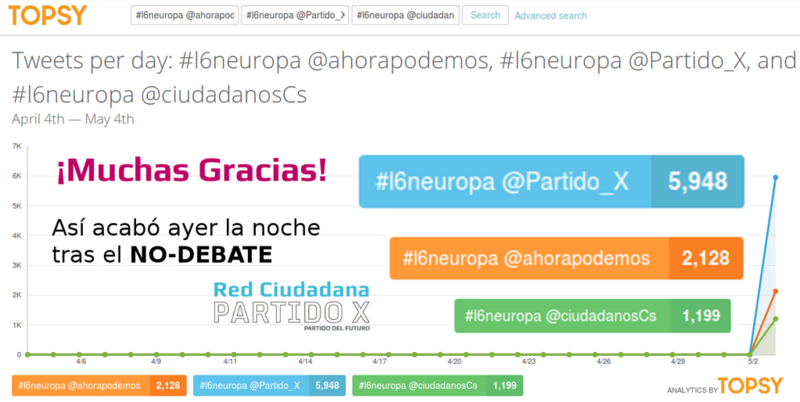 Ciudadanos also skilfully mixed the regular presence of its candidate Javier Nart and its leader Albert Rivera on television with an efficient, personal use of social media. Although it wasn’t as striking as the rise of Podemos, Ciduadanos triumphed on its fourth attempt to make the leap into national politics. Their decision to become regular talk-show guests paid dividends.. In our case, our failure to contemplate the possibility that television networks would not comply with the law during the campaign period was our greatest error. This was a strategic error that we have had to pay for; a naivety that we cannot blame on anyone but ourselves. With a highly dynamic community that inhabited social networks from the start as a natural medium for developing and spreading the message, we were able to successfully resist what we were expecting – everyday competition against TV. But we had expected to get a break, and certainly not to an escalation during the electoral campaign, where we had imagined that there would simply be a great pro-PPSOE deployment. We congratulate those whose strategic forecast turned out to be closer to the real situation. We don’t share the moral high-ground of criticising those who recognised that window, which forms an integral part of a system and a game that is not democratic and that we have to change, and were able to use it. All the same, we’re not talking about trying to ban it: on the contrary, we think everybody should be given the same possibilities, the same spaces. And we can only wonder what would have happened if the talk show guest-candidates Iglesias and Nart hadn’t existed, and the only option had been Elpidio Silva. Now, his party would probably be an arbitrator on the political scene, based only on audience numbers. Perhaps anything goes when it comes to private television companies increasing their audiences. As civil society, we have to ask ourselves whether we can allow this. A lot is being done in this direction already. While newspaper editors used to wake up thinking “I’m going to decide what is news today”, now they often say “I’m going to see what social networks say is news today”, but it’s still not enough. And now, the most important question that we have to consider in a text in which we analyse our strategy is: if private television networks had respected the democratic plurality required by law, or something close to it, would we have been prepared for the media circus? This is one of the big tasks that are still pending for us as a Citizen Network in order to achieve effective election results here, in the real world. We will return to this later, talking about the task of the spokesperson and about personality politics. 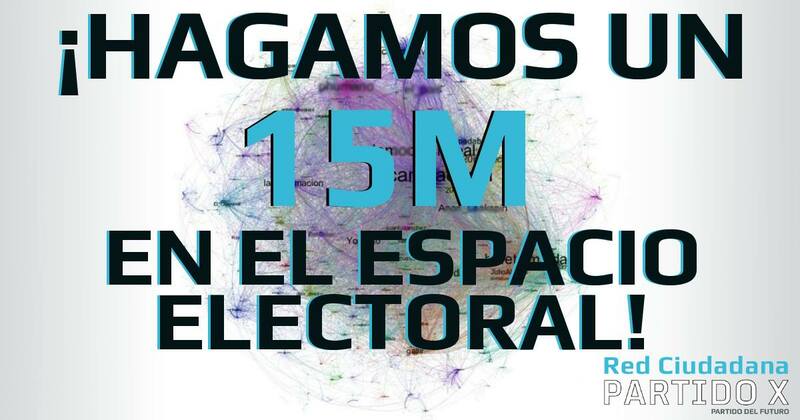 On 25-M 2014, the Partido X Citizen Network received 100,115 votes (without taking into account some cases fraud that we will discuss below and that are interesting in themselves, not because they would have significantly changed the result). As we mentioned when talking about the concentration of the protest vote and the tactical vote, the people who voted for us were people who were aware of the differential nature of our project. And we’re talking about a very large number of people. The vote we received is a vote with intention; an active intention. Not without reason, the Podemos tsunami has captured all the attention. But we should certainly acknowledge that surpassing 100,000 votes in less than a year and a half of existence, without media or financial support, and with founders who were not politicians from other parties but ordinary citizens, and with only 6 minutes of television airtime during the entire campaign, is something that nobody had done in Spain before us. In Europe, a similar phenomenon has only taken place 4 times in the past 20 years, and always in countries much larger than Spain. For all of these reasons, we are very proud of the results we achieved, which more than make up for the enormous effort that we have put into it. The project we are proposing is complex, and it anticipates and hastens the future. It proposes a total re-evaluation of the role of “parties”, of the processes and methods that we as citizens must adopt in order to achieve democracy, and it questions all the clichés about how we have to behave in this sphere. For this reason it is not a cliché or easy to understand unless we pay attention to it. For this reason, we are enormously grateful to all those who have recognised our effort and found it worthwhile, and have accepted the responsibility of listening to our project and understanding it..
We consider each one of those 100,115 votes to be the gesture of a person who has taken a step towards the active construction of something new. So we consider it a great responsibility to keep opening up this practical path and, above all, to not squander the power of radical, reasoned change that this project has managed to put together. Nonetheless, if we stood for election, it was in order to win seats. And from this perspective the result has not been enough. Those who voted for us have to know what we will do to remedy this. The results were lower than we expected, and this is precisely why we are doing this in-depth analysis: to understand the obstacles, the errors, the things that can be improved and those that can’t, and how to continue in order to attain our shared objectives. After looking at the subject of television as the factor that most decisively affected our initial calculations, we will now move on to our assessment of our legacy, our function, and the improvements that are necessary, adding external feedback to the internal evaluation of the network. In total, we received some 4,000 documents from people who were involved in this citizen network to a lesser or greater extent. Over a year ago we declared a project for citizens to break away from a political class that is not up to scratch..
We entered a space that was taboo and that in some sense was looked down on by those who fight from the grassroots: the electoral battle. We opened up the electoral front of mobilisations that are a force of democratisation, contributing to building a powerful constituent path within the world of public institutions, which, in this sense, channelled the power of citizen outrage towards a position that acts as a road block – in an explosive situation – to regenerationist, xenophobic, far-right and autocratic developments. We introduced a rational, constructive rigour that helped to boost the possibility of constructing something new, not just expressing the fact that we are fed up. We did this as one of the logical consequences of the 15-M movement in which collective intelligence had chosen the path of specialising on several fronts. In our case, it was the democracy front, the battle of citizen sovereignty over institutions. The idea was to do this without allowing ourselves to be absorbed into the inertias of these compromised spaces. – It requires trust and passivity -> we, because we are anonymous, encouraged mistrust and watchfulness; responsibility.. It seeks ideological polarisation -> we decided to stop confronting each other and to agree on a series of minimum aims that are achievable if we work together that overhaul the tired old clichés based on confrontation, which haven’t been able to find solutions, and which are often the result of having ideologies as the starting point and the destination. “We won’t defend ideologies over and above our ideals.” Which is to say, that what we are saying here should not be interpreted as meaning that we are followers of any one particular ideology. We defend a distributed citizen democracy based on efficient channels..
To achieve this, two things have defined us from the start: we are a citizen network – a citizen lobby that scientifically studies tried and tested paths towards real, advanced democracy and citizen control of financial flows..
At the same time, we can, if necessary, take on the form of a political party, because the only way to lobby and achieve change is to be a real threat..
We think it is the right strategy. We’ve already done a lot of work (Democracia y Punto, 15MpaRato, anti-corruption work…) and the period in the lead-up to an election is an opportunity to force us to accelerate towards our objectives. So we must continue to apply pressure, drawing attention to existing strategies that we already put into practice at the appropriate moments on the political calendar, and continuing to use elections to become a real “threat” and accelerate these necessary changes. At the same time, the fruit of this “scientific” work is “copyleft”, which means that it is available to anybody who wants to use it, although we hope that those who choose to do so understand the complex nuances that make a real difference, and stay away from the predatory attitude and simplifications that can reduce it a superficial interface that conceals more of the same. We still believe that skills and know-how can and should be federated among groups that have developed serious, programmatic lines of work. This accumulation of knowledge and experience, this diversity, tends to favour more inclusive and effective solutions. 1.- To achieve a grassroots break away from the two major parties that we are calling “the PPSOE”, so that the work of citizens would bring down the two-party system and cronyism..
2.- To change the definition and the role of political parties in the 21st century..
To radically transform the way we understand parties, the way programmes, lists, financing, accounts, and so on work, and to do it methodologically and in-depth..
3.- Citizens as active subjects that supervise their institutions. And to this end we created the programme “Just Democracy”..
We broke the ice, we were pioneers and we charted a path that had an enormous influence on what came next, raising the bar of the quality standards of what we consider democracy and citizen organisation in the context of elections. A year ago even those who were most in favour of these ideas considered them to be utopian; now they are standard elements in the speeches of all parties, and that fact that they can make these speeches forces them to at least keep up appearances. It depends on us, as a watchful citizenry, to ensure that these seeds grow into something more than speeches. By putting them into practice. We believe that when we look back in history, we will find that the PPSOE died on 15 May 2011. The fact that citizens made this patently clear in these elections is a collective victory. Obviously, there is still much to be done. That’s how history works: a lot of time can pass between the start of a process and the profound changes that take place when it ends. This is what we think our work has been, and what it continues to be. To make these changes come about as soon as possible. We are happy if our role has been to break the ice. How we can be useful: “Just Democracy”. So, based on our diagnosis that the PPSOE is finished, and that it’s just a matter of time before this fact becomes visible to everybody, we came to the conclusion that our project should focus on two aspects: to hasten that moment, and to work on what would come next. A democracy, not a cronyism. This won’t be achieved by putting new faces in the place of the old, agreeable parties in the place of disagreeable ones, or good politicians in the place of bad politicians… although that’s part of it.. It will be achieved by changing the way things are done, by designing precise mechanisms for a new governance that does not just encompass the expert knowledge of citizens, but also their capacity to control institutions. In other words: “Just Democracy” (DyP).. The DyP programme is an effective, organised method for the distribution of power among citizens. “Just Democracy”: After carrying out preliminary work in several areas, we have studied and compiled the best examples of democratic innovation in Europe and around the world, and we’ve put them together in a totally new, radical democratisation programme without parallels. Nobody who appreciates democracy will be able to object to it, as long as they allow us five minutes to explain it calmly. 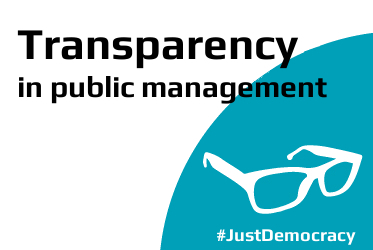 The programme starts with the idea of transparent public management, in the most radical sense; it then draws on lessons from the best models of consultation, proposal and approval/rejection, and arrives at the powerful idea that it is “not about asking citizens for their vote, but returning their vote to them” the right to real, ongoing voting and to binding referendums. Now we have to continue working to ensure that this will be the change that we really want. This is how we have designed, built and tested the most advanced system for distributed, radical organisation that exists to date. And there is still a lot of work to be done before it starts to be implemented in our public institutions. As an advanced programme for 21st century democracy, Democracia y Punto defends the fact that democracy provides citizens with specific, quick and effective channels by which to supervise and control their public institutions. Based on this idea of supervision that is an intrinsic part of our proposal, and given that we are essentially practical people, we decided to supervise the process of this election campaign. Observing the developments from within, we realised that there is still a long way to go before we achieve elections that are truly democratic in the way they actually operate. Given that tens of thousands of Spanish citizens in many different countries failed to receive the documents required to vote, as Marea Granate (the “Maroon tide” movement of Spanish migrants) repeatedly denounced, we have seen that “incidents” in the electoral process are the norm on home ground too. Why? Because the national electoral commission, which should have intervened in most of the cases that we will mention, has been designed to say nothing. These are probably the first elections since the transition to democracy to be truly supervised from within. The first elections with citizen surveillance..
Now it is our task to tell what we have seen during this experience. The things that we explain below are not in any way intended to be read in relation to the election results. It is simply our way of sharing the information so that everybody can see what elections are like here and now, in the 21st century.. Unfortunately, like most laws, electoral laws are trampled with total impunity when other interests prevail. The first thing that becomes clear when you try to stand for elections is the total lack of synchronisation and the lack of channels that allow information to flow between the different public bodies involved. On one hand, there is a lack of coordination between the electoral commissions at different levels of government (national -JEC- , provincial -JEP-, and zone -JEZ-), but above all between the electoral commissions and City Councils. We found that when you try to find out about the different aspects that you need to take into account if you want to stand for election, it was quite common to be given contradictory information, or even to discover that the people in charge of providing the details of the process have no idea of what is involved. The electoral process is designed to be inefficient and cumbersome, in spite of the efforts and hard work of all the civil servants and other people involved, as we’ve been able to verify repeatedly. We were particularly amazed to discover that the only communication channel that Spain’s electoral commissions accept as valid in the 21st century is the fax machine, a circumstance that makes communication truly slow and tedious. The first step we took was to review the legislation on this matter. The Spanish electoral process is governed by the Ley Orgánica del Régimen Electoral General (LOREG). In general, the LOREG calendar specifies a series of totally illogical deadlines to stand for elections and organise an election campaign: a ridiculously short time to raise funding; a maximum of 24 hours to notify the JEC after opening a bank account for election-related expenses; the requirement that these expenses must be incurred in the same period in which the funding is raised; notification of the technical specifications of television spots 48 hours in advance of the delivery deadline, including weekends, etc. As if that weren’t enough, these tight deadlines are systematically flouted, so that it is often literally impossible to carry out the necessary formalities: Provincial and zone electoral commissions that begin operating days after the deadline that they themselves have set, and do so without the necessary resources (without computers, fax machines or telephones, only tables and chairs); notification of the dates for the draw of advertising spaces that never turn up, or turn up after the draw; contracts that influence the allocation of free spaces in media outlets that are never given to the candidates, or only when it is too late to change broadcast plans, and so on. Another major problem is the lack of a single set of criteria shared by all the electoral commissions, so that each procedure is carried out differently in each place. True caos. The criteria for the distribution of billboard spaces vary; the dimensions of the billboards vary; the procedures for requesting venues for election campaign events vary, and so on. In addition, the competences set out in the LOREG are not respected: procedures that can legally be carried out at a provincial commission are forced to go before a zone commission, which means that the representatives of the candidacy have to travel hundreds of kilometres, sometimes just to submit or pick up a document; or procedures that are legally the responsibilities of the provincial commissions, but are rerouted by them to the zone commissions, which in turn channel them to the government delegation, which in turn sends them to the Departments of Home Affairs and Security, which channels them back to the provincial committee, in a bureaucratic circle in which an answer is never given, even though the solution is set out in the legislation, etc. – In general, electoral commissions work tirelessly to ensure that everything happens when it should, while city councils put pressure on the electoral commissions and contradict them with total impunity, doing and undoing whatever they like based on the power they wield at the municipal level: venues for election campaign acts legally awarded to parties running for election by a zone commission, and later refused by a City Council that has no authority in this regard; notifications in which a zone commission specifically urges a city council to specify the spaces that have been assigned to candidates for election advertising, without this leading them to lift a finger; pressure applied by municipal security forces in public acts of candidates that are not those of the municipal governing party, etc. – Irregularities on election day.. On the elections on 25 May, Partido X organised a citizen deployment to monitor the process and its compliance with standard democratic procedure. We provided a telephone line where people could report incidents from 8 am to 9 pm. It was jammed with calls and did not stop ringing all day. We received and resolved hundreds of incidents. We also launched the hashtag #PartidoXinforma on twitter, which was used by over 14,000 people to notify and resolve problems with our consultancy service for irregularities. On election day, 80% of incidents were related with the unfair distribution of the ballot papers at the polling stations, while 20% denounced the fact that some ballot papers were missing altogether. In most cases, the polling stations only provided ballot papers for the major parties in the secret vote cabins, and the ballot papers for emerging parties were often stored in boxes, rather than being laid out on the tables with the others. They did not take into account the fact that the auditors and agents of the major parties often violate the law in regard to the ban on partisan advertising at polling stations by carrying folders and bags with full-colour advertising of their parties. During the vote counting at the polling stations, 100% of the incidents reported were related to very worrying errors in the counting process. 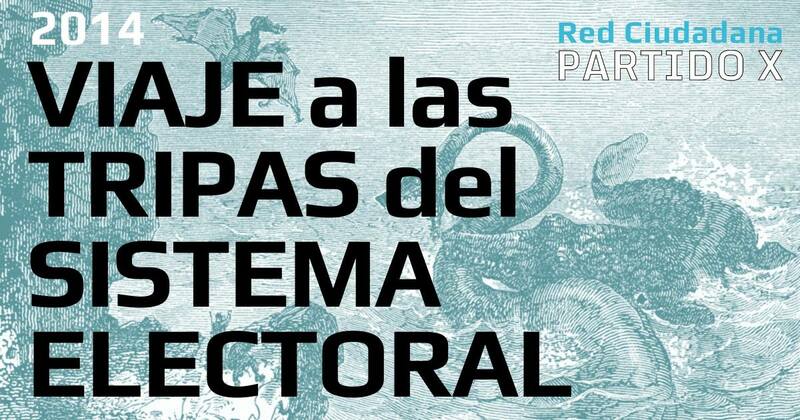 In our case, a mix-up between ballots papers for “Red Ciudadana Partido X” and those for “Movimiento RED” was detected at dozens of tables; dozens of cases in which votes for one party were checked and written down in the report of the session, but later don’t appear on the vote counting report; dozens of cases of citizens who claimed to know of at least a few votes in their town had gone to a party that was reported as receiving zero votes in the vote counting report; cases in which members of a polling station try to avoid including votes from minor parties in the count because “there are a lot of them and it’s getting late,” etc. In addition to this, there was the regular refusal by members of the polling stations to record the complaints of the representatives, generally because of fear or ignorance. Things didn’t get better during the general vote count. The representatives are not allowed to make complaints that are not directly related to mistakes in the adding up or transmitting of the data recorded in the report. That is, they cannot make any complaint arising from the detection of irregularities in the vote count. Paradoxically, after all the previous work and the deployment on election day, the ballot papers and envelopes are destroyed as soon as the votes have been counted at the polling stations, which means that the general vote count in Spain is limited to reading the report of the count of the polling stations, and checking that the data was transmitted correctly (and it turns out that in some provinces not even this is done). In other words, it is impossible to raise a complaint that was not notified on-site at the polling station, even given that they are open for a 12-hour voting period and the exhaustion that this entails for everybody involved. This is particularly problematic given that the majority of complaints are received in retrospect, when there is no longer any possibility of taking action, such as cases where people who have voted at a table find that their vote has not been recorded (which is the most frequent case). In other countries, ballot papers are stored, and a complete recount takes place in the general vote count, thus preventing electoral fraud as far as possible. Also, a the envelopes containing valid votes are destroyed, and only null or blank votes are kept, when there is a difference between the recount of the number of voters and the number of envelopes, it is compensated for by adding an empty envelope (blank vote) so that there is no need to impugn the polling stations. In our specific case, we were able to correct part of these errors in the polling stations where we had auditors. But in places where we didn’t have a representative we couldn’t do so, and we received messages from dozens of people who had voted for us but found that there was no record of a vote for us at their polling station. 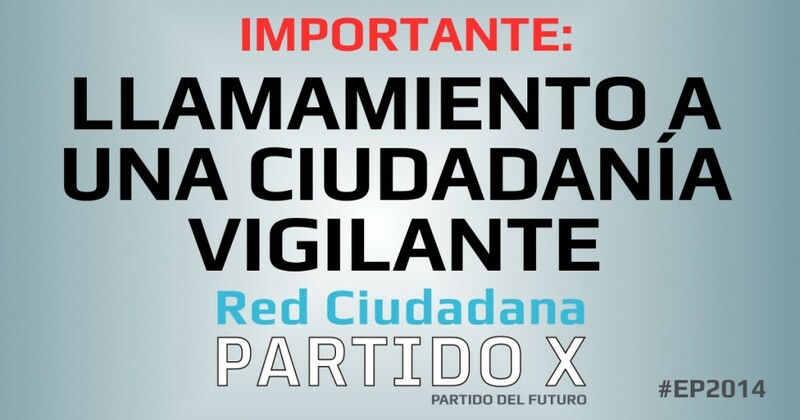 On at least three occasions, we witnessed a vote for Red Ciudadana Partido X being allocated to RED because it “sounded familiar” to the members of the table (they watched TV too :))..
We estimate that we lost a minimum of 10,000 votes in this way. We were present in 22 cities, and monitored around 1,000 of the approximately 50,000 tables in Spain. This error, by which our votes were assigned to Elpidio Silva’s RED party, occurred in 14% of the cases that we were able to monitor, with between 3 and 22 votes lost in each case. Below we explain why this was another serious mistake that we made, although we repeat that we are not saying this as a personal claim – those 10,000 votes would not have significantly altered the results – but to share an example that shows the impossibility of avoiding fraud unless we change the way the electoral commission has been functioning to date. We’ll wrap up this section by talking about the flagrant case for postal voting; ; for people within Spain, but very especially for Spaniards living abroad. 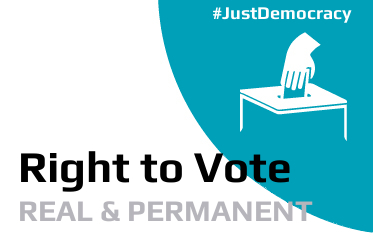 Anomalies in the system of sending the documentation required for postal voting have resulted in thousands of citizens being unable to exercise their right to vote, and thus being left out of even the tiny window of democracy that elections provide. It is simply unforgivable. And on top of this, some of those who did manage to vote were not sent envelopes, meaning that up to 24% of the votes received were considered null in several provinces – far exceeding the usual average of 1.7% percent in these cases. The most recent reform of the LOREG, which was supposed to improve the security of voting from abroad, sets out bureaucratic procedures and deadlines so impossible that, in the words of a civil service from the provincial electoral commission: “After this reform, the number of people who vote from abroad went down 80%. This is unacceptable.” We need to come up with a system that is secure but does not discourage voting. In short, we knew that there was still a long road to cover before achieving Just Democracy. From now on, we also have to take into account the fact that this unsatisfactory democracy works equally badly on its big day in the spotlight: the general elections every four years. We’re going to take action to change this. You will find more information in this interesting article on the subject. For people like us who are thrilled about the current “renewal”, the good news is that the Podemos landslide has forced a reconfiguration of the left that both IU and PSOE were resistant to. The same dynamic affected the right, although a seriously weakened PP is still hanging on. Now that “the PPSOE” is negotiating their survival both in Europe and Spain, the left-right fronts are open to new agents. The bad news is that immediately after the results, we are seeing a scenario of classic left-right ideological confrontation, due to the attacks on Podemos because of their extremely strong entrance on the scene. In our opinion, the danger – and part of our founding hypothesis (which leads us to prioritise methodology over ideology and see ideologies as tools rather than symbols of identity) – is the fact that these confrontations create inertias that force people into dogmatic ideological entrenchments that are contrary to innovation and genuine change. They pit citizens against each other, when in reality we have common problems, and they make us go back and wipe out the steps we had taken towards innovation in order to return to “our” safe places. In this situation, what we can contribute is continuity in regard to innovation, a methodological approach that has been useful and can continue to be useful to all parties, in order to profoundly overhaul democratic channels. We are continuing our work on designing pragmatic proposals that stay a step ahead of events, and that will end up being adopted. We will continue to defend the idea of federation rather than fusion –as in “the big fish eats the little fish” of traditional politics– in order to preserve the diversity of contributions. – We have to come to an agreement on the basics, because democracy does not mean that everybody agrees, but it does require reaching agreements that will allow us to develop solutions to shared problems based on the skills available, without absorbing others or undue appropriation of the collective imaginary. We have to defend the singularity of experiences, rather than merging and reducing all elements to the same thing. We have to collaborate in a way that acknowledges differences, otherwise we will keep doing more of the same, and, tragically, the results will also remain the same. We will continue to promote controlled growth based on affinity and collaborative work rather than just on desire, opinions and enthusiasm (which are still there) because we promote the federation of adult, autonomous individuals with responsibility.. It may not be a very explosive form of growth, but it allows us to defend a broad-based, long-term complex project. It is a structure that can withstand time, without distorting its aims. The idea is to overcome the open/closed dichotomy in order to avoid the shortcomings of both options. It is a project that is networked and open source: development in the form of working groups based on affinities, which openly publicise their results, so that anybody can use them. In open source software projects anybody can see the code, but only the final stable version that the development community considers useful is adopted. We have chosen to work with precision, to be united, and to build in a more scalable manner. While this means that we have to renounce very disruptive, rapid growth, we believe that it guarantees that the pre-established objectives will be reliably respected. We defend the idea that individuals and groups who are actively committed to specific struggles should be considered “experts”, in other words, civil society as experts, rather than experts as experts :). Our programmes acknowledge authorship, and it is easy to recognise the hand, and the work of the individuals and groups who are actively committed to sustained, specific struggles. In short, how can we be useful? If we really want to arrive at different results, we can contribute to being able to do something different, truly different.. Here are the main points of this working method. Aside from the errors discussed above, there are other aspects that require in-depth review in order to face the second stage of the project. In this first phase we have been very self-absorbed in the construction of the roadmap and the structure. Too much so. Perhaps it was unavoidable in order to create the robust structure that we now have, but at the same time it has not left us enough time to be close to certain vital social situations that it is important to attend to. Maybe we wouldn’t have been able to do so properly if we had left the roadmap unfinished. But now is the time to connect the project and put it at the service of many more specific situations. As we were saying, the project is complex because of its novelty: because it turns many of the clichés and hypothesis that we are used to upside down. This makes it difficult to transmit. When we’ve tried to find a way to express it, we’ve often been too “theoretical”, or we’ve tried to explain too many things at the same time. Now it’s hard to know whether we would have been able to explain less, and still kept to the deadlines imposed by the political agenda. In any case, it’s clear that we need to find a simple, clear way of explaining it, without leaving out the essential nuances. This is a great communication challenge that we have to meet on all fronts: online, in networks, and in face-to-face contact. We are going to work hard to explain this complex project made up of a great many elements, in a more schematic, more “human” way. This raises another problem in the electoral sphere: we’ve tried to design and glimpse an ethically desirable future for democracy. Perhaps we presented ourselves as “the future” of too many things. The present has proved to be more schematic: the urgent need to break away from the PPSOE. This has been our underlying idea from the start, ever since Aritmetica20N, but we’ve rarely talked about it and this has not been very effective as a direct electoral strategy. Similarly, our decision to not talk about how bad things are, and instead contribute positive messages – to build rather than complain –, has reduced the emotional power of the messages that we wanted to transmit. In real life it’s always easier to find examples of problems than solutions. Our method is based on looking for examples of solutions. But it can be difficult to understand things that are not accompanied by real life experiences. This is a handicap that we need to resolve. Our messages should have been grounded, with examples that are closer to everyday reality, in order to graphically explain some of our methodological proposals. At the same time, while Just Democracy was easier to transmit and reach people, we need to offer a clearer explanation of the tools that we can use to fight corruption. This fight is one of the methods we want to use to embark on a new economic model that will put us on a path to prosperity, not to sacrifice for its own sake. We didn’t manage to sufficiently specify why the fight against corruption is a crucial and strategic element that will lead to economic democracy and to a true, definitive way out of the crisis. Our own actions were practical examples, but we didn’t manage to correctly explain their importance and their scope, in a short enough time to ensure that it could reach everybody. From the outset, our reasoning is based on citizen control of power, and this means the distribution of power. By its very nature, the reasoning of personality politics is the opposite – the accumulation of power in one or several figures, who represent the message. As such these personalities cannot be contradicted, and no other voices can be heard, even if the person in question does not want this to be the case. Everything that he or she says, or decides, will represent what the whole organisation wants to say or do. We think that this is also damaging because it induces passivity – the idea that others will act – while we want to encourage the idea of a watchful society that takes responsibility for its future, and stops trusting what others tell them. In order to oppose this logic of personality politics used in traditional party politics, we began by presenting ourselves anonymously. This proved to be a correct strategy judging by the media impact we received in response to the novelty of the strategy. Later, when the project needed recognisable faces because it was moving into the phase in which we had to ask people to trust specific individuals who would be sent to represent us in a parliament or specific tasks, we decided on a distributed leadership of citizens with skills and experience in different aspects, who may or may not have been known by the general public, but were all recognised and respected in their fields. The emphasis on rejecting personalities in favour of the skills of each person, which is something that we want to hold onto, has met that we did not have enough people to offer a clear spokesperson or spokespeople, or at least one that remained unchanged for long enough to become clear and recognisable. Recognisable individuals who could become a point of reference, identifiable with the discourse. We need to find a way to become less confusing in this sense. It’s naive to think that everybody can be spokesperson – it’s a skill that not everybody has, and even though we want to and have to bring about change in this regard, it will probably be impossible to find a solution that is as distributed as we would have liked it to be. And this is not the only reason. We’ve been too extreme. We know that people who take on the role of spokesperson or who stand as candidates end up with a level of visibility that can be dangerous for the project: they represent publicly, and this means that if they stray from the project they take away all credibility and symbolic capital, leaving the collective work without value, and without the claim to respect. We don’t want this coercion between collective work and those who represent it to exist any longer, and this is why we want to distribute the role. But faces are fundamental in politics, because we are ultimately asking people to place their fate in the hands of others. This is why the relationship with the personality/person is also important. In the attempt to find a balance between non-personality politics – not concentrating power in a few figures – and the need for people who we can delegate to, and who we can trust, we haven’t found the exact point and we have made mistakes. Finally, there have been circumstantial but serious errors in the project image that, as we explained above, led us to lose several tens of thousands of votes. We were unable to react in time to the confusion created by another party in terms of the similarity with our name, which is something we could have avoided. We have a very robust network of citizens, hundreds of people who’ve learnt to work together with extreme precision and co-ordination. We have created a true “Ninja” group ;) to defend and develop Just Democracy and several systems for citizen supervision of finances, institutions and electoral processes, as well as a highly skilled, fast and flexible network in anti-corruption matters. We have the collaboration of people with years of experience pursuing financial fraud and designing and constructing instruments and devices for real distributed democracy: 15MpaRato, the defense of swindled shareholders and the victims of bank fraud such as Spain’s “preferentes”, the struggle against tax havens and tax evasion (Falciani, Burillo…), OperaciónEuribor, X.net and the Free Culture Fourm, Susana Martín Belmonte’s research into debt and alternative monetary policies… And there numerous very interesting open fronts in all these fields. Our skills and expertise are at the service of all real processes of change. On the other hand, we have a programme for the European elections that includes many practical, feasible actions that haven’t yet been tried and we would like to see them implemented. We offer them to those who did enter the European Parliament and are prepared to work towards seeing them successfully put into practice. If you’ve read this far, thank you for your patience and we hope it has been useful, and that you’ve enjoyed reading our account of this experience. We want to share it with everybody who may be interested. This weekend we will hold a plenary meeting of Red Ciudadana in which, based on this assessment, we will define the roadmap for the future. The idea is to go into cruising speed and continue to work towards the objectives we have set. Next week we will publish it. We have opened up a scenario of possibilities. It is our responsibility to finish what we started.